Ah water …. We clean with it, cook with it, use it in our yards, wash in it & swim in it, but for some reason we seem to avoid drinking it….. at least as much as we should. **The biggie is of course hydration, but drinking water regularly also helps to keep your energy levels up and the achy dragging along feeling at bay. Fatigue is often the result of mild dehydration which can make our days feel even longer than they are. By the way, drinking sodas, coffee (I am an addict), tea and alcohol all dehydrate your muscles, so for each cup/glass I have, I always add an extra glass of water for good measure. **Staying hydrated helps keep you looking younger. Our skin is actually the largest organ in our body and regularly drinking water can actually improve the color and texture of your skin. Hydrated skin glows and looks supple, where being dehydrated leaves us looking older and drawn. **Drinking water aids in curbing your appetite. Sometimes when we think we are hungry, we are actually dehydrated and need water! FYI, being dehydrated can actually make you gain weight as your body will begin hanging onto any and all fluids trying to keep the body functioning properly. Water will also keep you feeling full, helping you not eat so much in a sitting. **Drinking water can ease joint pain as it aids in keeping the cartilage soft and hydrated. Who doesn’t want to feel less achy? **Water flushes out waste and bacteria. Our body need water to function properly. If we aren’t putting it in, it can’t properly flush out the things that are bad for us. If it is holding on to waste, we are putting ourselves in danger for problems down the road. **Prevention of headaches. Many headaches come on as a result of dehydration (I experienced that my first day at the Kentucky Derby last week), so drinking water can help end or ease that annoying head pain. **It puts you in a good mood! When your body is functioning at its best, you will feel great making your days much more productive and happy. So, now we all know why we need to drink more water, especially as the days continue to warm-up, but how can we get in enough water to benefit us when we also know just how boring drinking water can be! Yes, there are Crystal Light packets that you can use to flavor your water, (they seem to leave my mouth dry) but they contain artificial sweeteners and have no nutritional value to them. I try my best to limit artificial sweeteners or contain them to natural sweeteners or stevia just for health’s sake. So, how do you keep water from being so boring? Why dress it up of course! 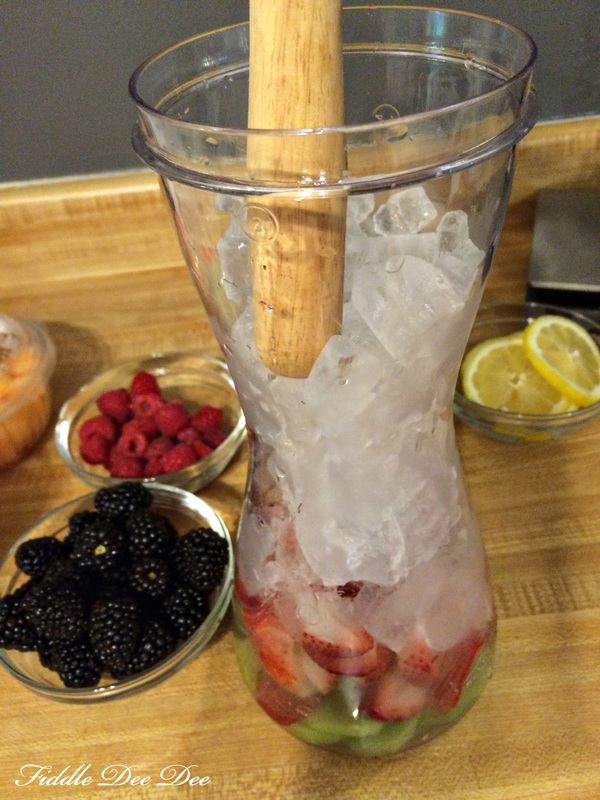 Fruit infused water is fresh, clean and a great way to flavor your water without fake anything. 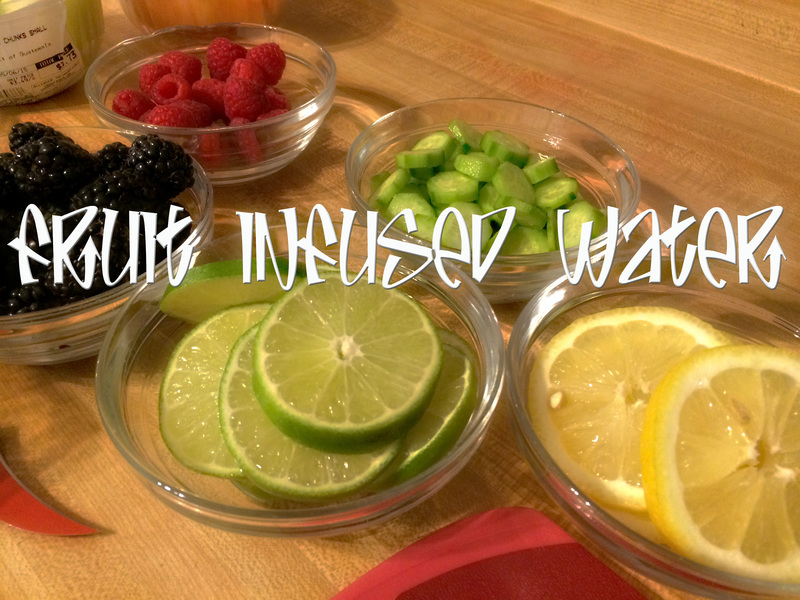 It is also super easy to create fruit infused water as well as many possibilities that can incorporate seasonal flavor all spring and summer long! These aren’t sweet waters, but with the infused subtle flavors you really won’t miss the sugar. This is how I have managed my water intake for nearly 3 years now! Believe me, it works. 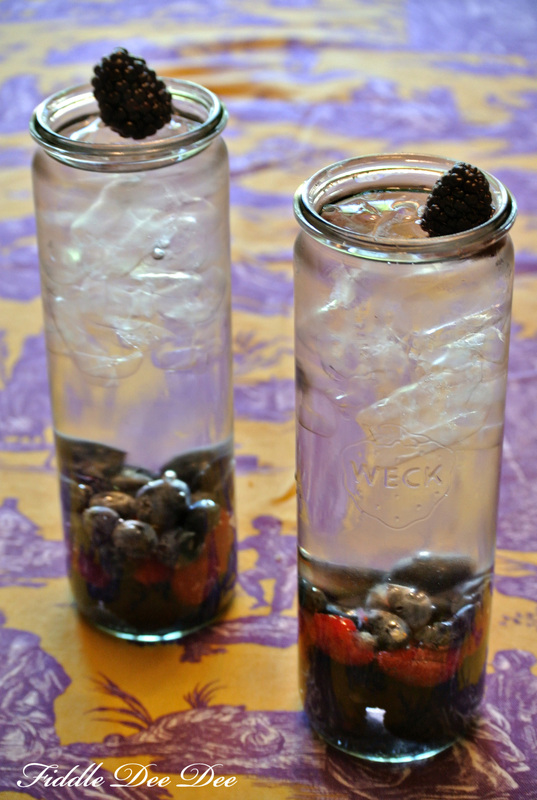 To assemble infused water is really quite elementary. I choose my favorite combinations of fruit; slice, dice or chunk, add to a pitcher of water and allow to steep for an hour or so. I also use fresh herbs from time to time like lavender, lemon thyme, rosemary, mint or chocolate mint…. options are limitless depending on your taste. While you can use frozen or canned fruit (in natural juice), I prefer using fresh fruit as the flavors seem to taste so much better. Purchasing what is in season (right now berries are a great option) helps with the budget. 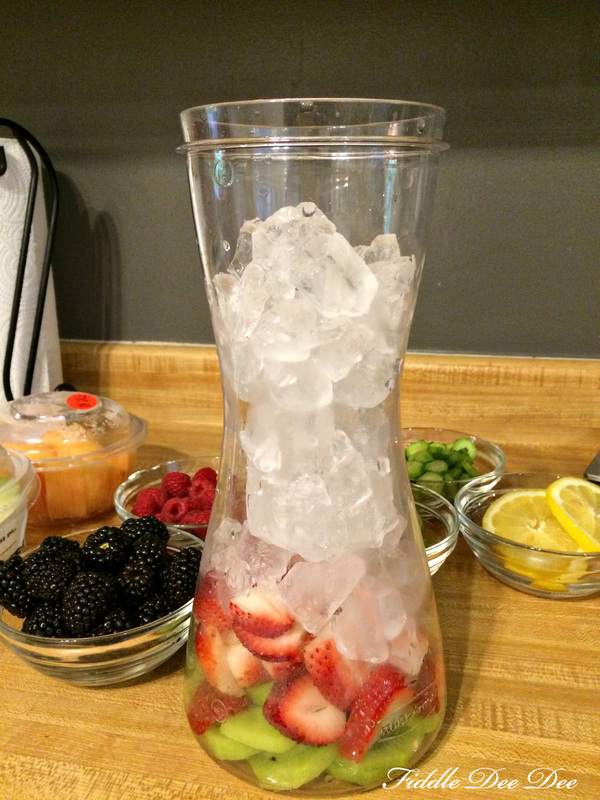 There isn’t really a wrong way to assemble your fruit infused water. You can spend money for a pitcher that is specifically made for this or just use what you already have at home. I prefer the latter. When assembling my waters I like to use a 2-quart or gallon pitcher. I add my fruits and herbs the night before to water, then place in the refrigerator to allow the flavors to mesh overnight. If you would like, you can bruise the fruit & herbs with a wooden spoon or pestle to strengthen the flavor of the water. When I do this, I usually pour my water through a strainer. The next day I just refill my glass of ice with water as needed all day long. 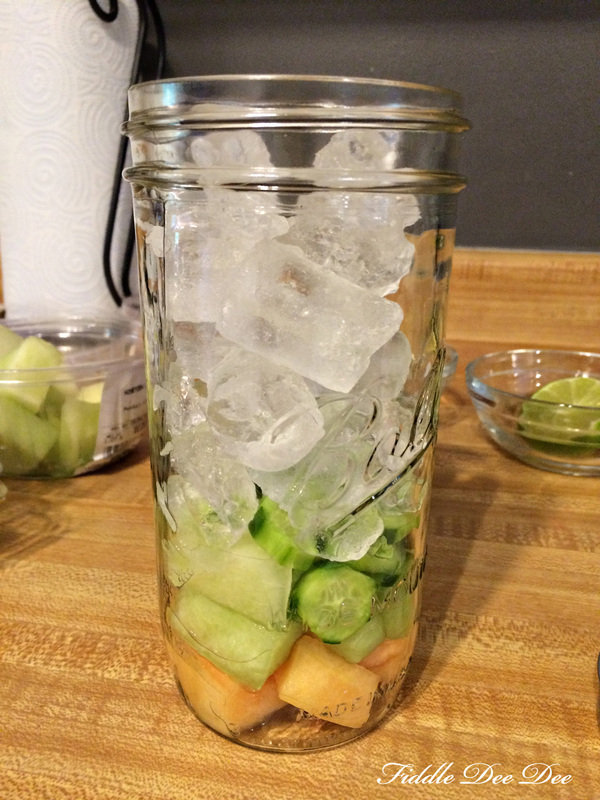 You can also flavor a single glass of water with just a few slivers of fruit in the bottom of a glass full of ice. Add the water last and let sit a few minutes. 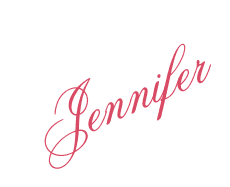 Here are a few of my favorite combinations …. 1. Lemon water. This is the easiest and most common was to dress up water. Slice a lemon, squeeze into a glass of ice-cold water and drink up. I also do this same thing with a lime. It’s quick and the tangy splash of citrus really wakes me up! Top it off with mint for added flavor. 2. Lime, cucumber and mint. Add 6 slices of lime to a 2 qt. 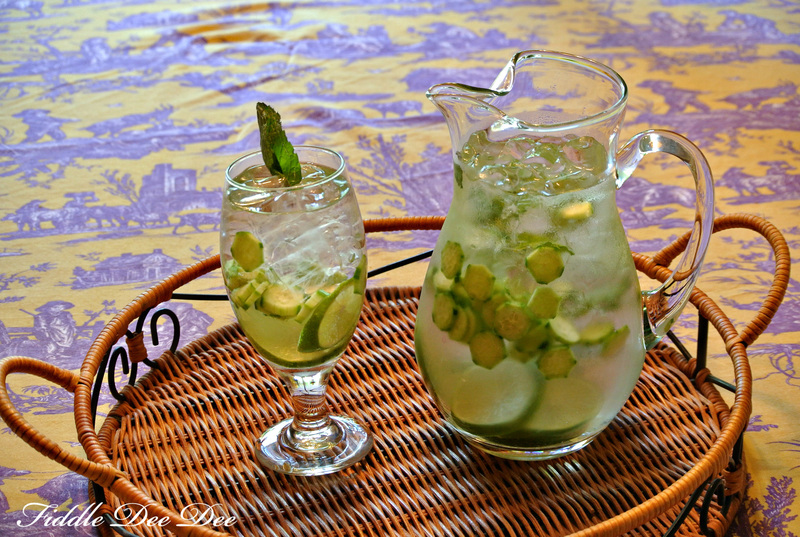 pitcher with half a seedless cucumber. Add ice and press with a wooden spoon (I used a pestle) to release the juices and fill with water. Let sit for 30-60 minutes and serve over ice. 3 or four kiwi (depends on how well you like the flavor of kiwi) thinly sliced added to 5 large strawberries, sliced. Cover with ice, release the flavor, fill with water and allow to sit in the refrigerator for about 45 minutes. 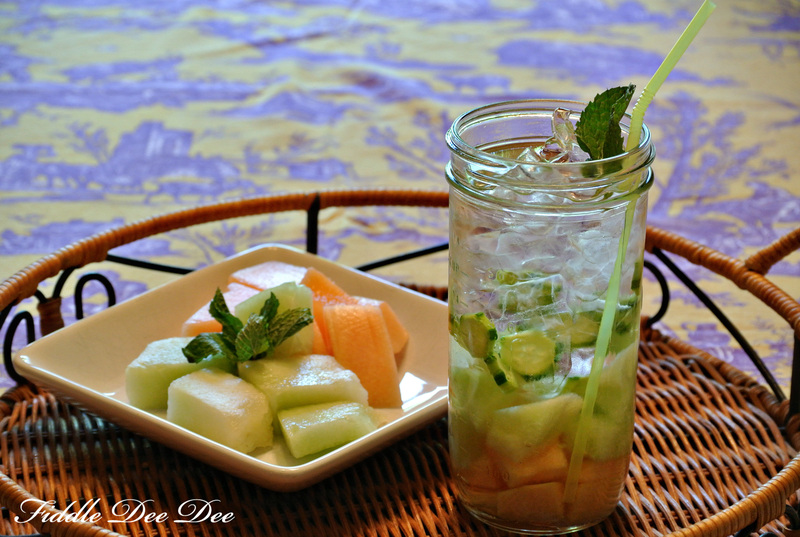 Honeydew & cantaloupe chunks mixed with several slices of cucumber keep this water light and refreshing. I like to mix this up single serving and continue to use the glass for a little while. By the glass I mix 6-8 blackberries, 8 raspberries and 10 blueberries, cover with ice and use the pestle to press on the ice and help release the juices. 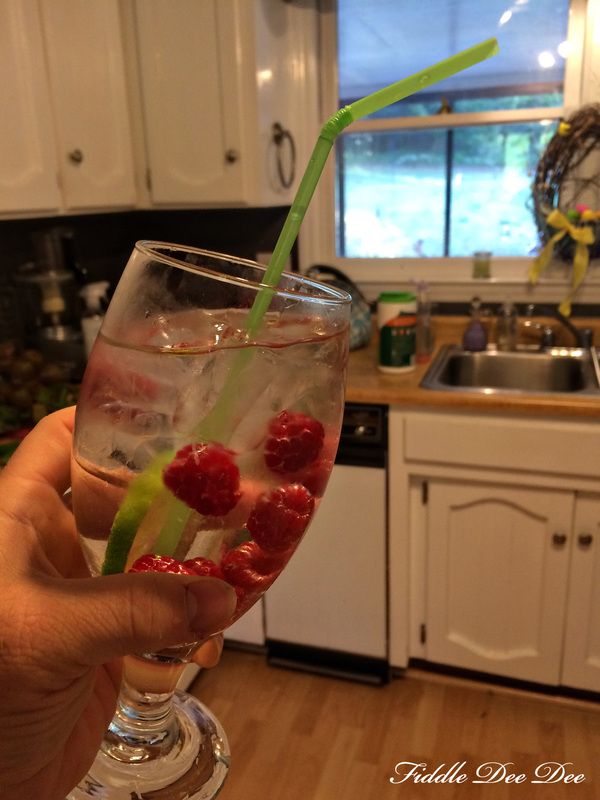 By the glass I use 10 raspberries, and 2 slices of lime. 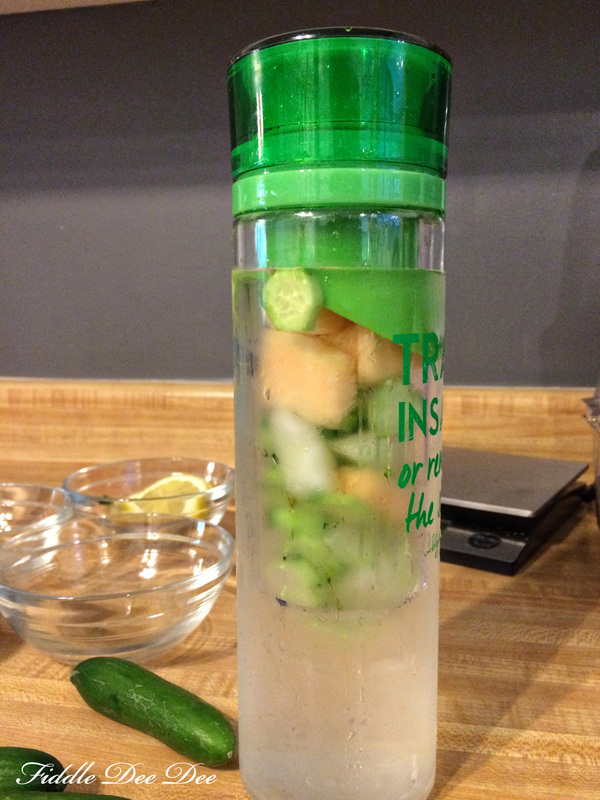 cucumber melon in a sports bottle with an infuser…. my 17 year old loves to use this at school! What makes these flavored waters even better is the fact they are so pretty. With the subtle flavors these are a perfect accompaniment to a cookout or pool party as the flavor doesn’t clash with most cook-out favorites. So how much water do we need? I recommend at least half your body weight in ounces. So if you weigh 150 pounds, you need 75 ounces of water a day; a little more if you live an active lifestyle. Me? Because I work out five days a week I try to get in a gallon a day because I lose so much through sweat. 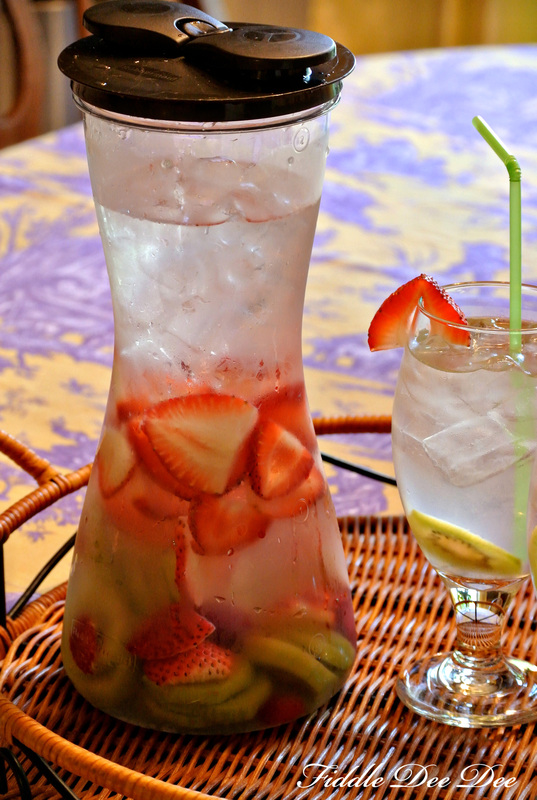 Try a few of these simple flavored waters and let me know what you think! And if you have a combination you like better, share it and let me know! I’m always up for trying something new! 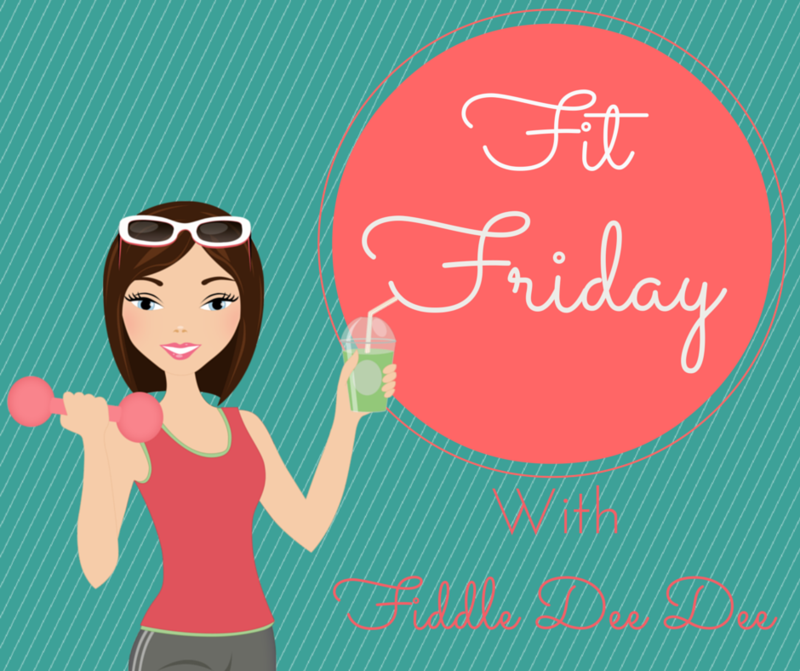 Have a fabulous weekend, and don’t forget to drink your water! I’ve been trying to drink more water too lately & adding some fruit to it. Ifound you on the bloggertunities blog hop.